Everybody knows that there are the cheese quesadillas , where the fresh and soft flavor of the cheese is wrapped in corn tortillas, which gives a precise flavor. Now if you are looking for a different style, a different consistency, a different texture ... it can be found in the requeson. The creamy, delicate and special flavor of the requeson will give variety to your quesadillas’ repertoire. What is fabulous about this recipe is that epazote and onion is added to the requeson; which are in charge of accentuating the Mexican flavor. Besides it is a very good recipe if you are on a diet because the requeson doesn’t have fat. This quesadillas dish is an excellent breakfast or entree dish ; which can be accompanied with some pot beans and a spicy pico de gallo. Preparing quesadillas is possibly one of the easiest recipes that there is in the Mexican cuisine. The requeson is practically the same as the “ricotta cheese" – perhaps the ricotta cheese is less moisty and a little sweeter. It can be said that it is the Italian version of the requeson. Prepare the corn tortillas that are used in this recipe so the quesadillas’ flavor has more freshness. This recipe is prepared with fresh epazote but you could also use 1 tablespoon of dried epazote. The preparation time is of 10 minutes . The recipe is for 6 requeson quesadillas. Finely chop 1/4 of an onion and 1 epazote sprig; then reserve. Put in a bowl 5.2 oz of requeson and mash it with a mixing spatula or with a fork, until having the consistency of a puree. The Onion that was minced. The Epazote that was minced. The epazote gives a sensation taste to the filling, you cannot miss it. Mix very well the bowl ingredients with the mixing spatula or with the fork, until having an homogeneous mixture; then set aside. Heat on a griddle over medium heat 6 maize tortillas for about 20 seconds per each side, until they soften. Put on each tortilla some of the filling that was prepared. Fold in half all the tortillas that were put on the griddle. Heat the requeson quesadillas for approximately 1½ minutes per each side, until the requeson is moderately heated and the tortillas are lightly browned. Suggestion: Don’t forget to put a salsa to the quesadillas like: the green salsa , the chipotle pepper salsa , guacamole , etc. Variations: The quesadillas’ filling is an invitation to your creativity because you can use mushrooms , squash blossom , huitlacoche , peppers , potato , etc. Did you like the Requeson Quesadilla? This is a good requeson that you can use to make your quesadillas. The flavor is very good and its freshness is sensational. 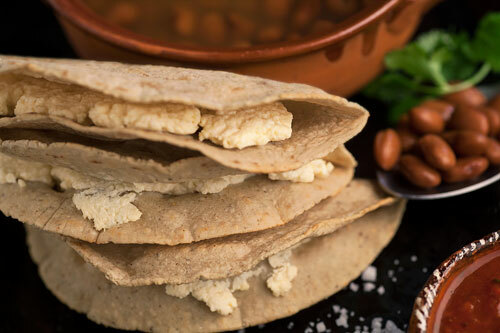 Use “La Banderita Corn Tortillas" to make your quesadillas, you will love them. Use a good griddle to heat your tortillas. With the “Hawkins Futura Griddle" your quesadillas will heat to perfection and the best is that nothing sticks to it.